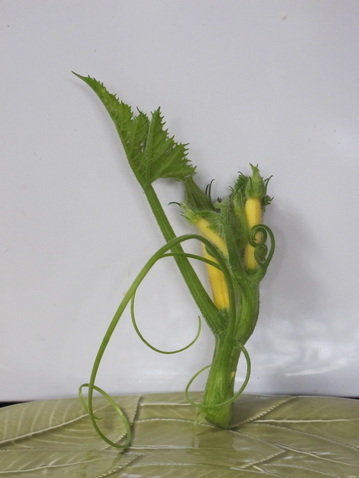 October is the last busy month in the Allotment year .The weather has been relatively good in recent weeks and my courgettes and squashes are now coming on well although I am not sure if they will reach maturity before the first frosts nip. The remainder of my tomato crop is still a bit small and green however it is possible to pick this before the frosts and let it ripen on a sunny window ledge . Sow some winter lettuce and a couple of short rows of winter hardy peas and broad beans towards the end of October - this will provide you with an early crop next Spring if the weather is favourable. Plant out Spring cabbage and overwintering types of onion and garlic. The last time I tried plating Japanese onion sets I had very low success but the results may be better using cloches. The overwintering types of onion will always do better in the warmer southern climes. This is a good time to dig up old rhubarb crowns and discard the oldest parts. Exposure to frost also helps to stimulate the rhubarbs regeneration and old crowns can be left outside for a few days before division and re-planting . When planting new raspberry and blackcurrant bushes make sure the ground is well prepared and add a good 500g of bone meal per plant to the base of the planting hole . This will slowly release its Nitrogen over the next year giving stronger and healthier plants. Remove old plant remains for composting. Turn over your old compost heaps to aerate them and remove any useable material for use on your beds. Then backfill your composting containers with the older material going to the bottom. It is a good idea to put an inch of soil on top of your compost layers as the naturally present bacteria will help with the composting process. Wash down your greenhouse to remove any overwintering bugs, fungus spores, moss etc. This will help protect any greenhouse plants which you are over-wintering. There are products on the market such as sulphur candles which will kill bugs, mould etc..However I prefer water, mild detergent and a scrubbing brush.